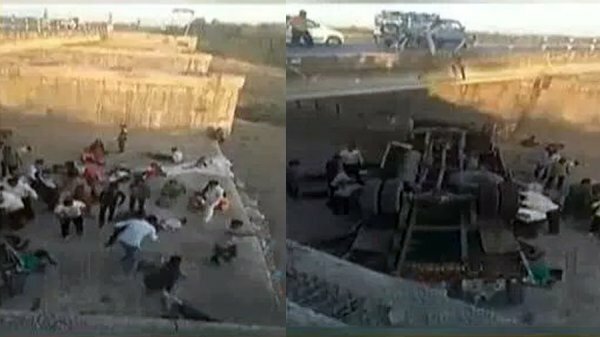 Thirty-one people were killed when a truck carrying over 60 people in a marriage procession fell into a drain from a bridge on the Rajkot-Bhavnagar highway near Randhora village. According to sources, the truck was carrying a marriage party when it met with the accident. The injured have been rushed to a local hospital. The truck was carrying around 60 people from Anida village, who were going to attend a wedding ceremony in Botad district, Bhavnagar’s in-charge Superintendent of Police I. M. Sayed said. “The truck fell into the pit when its driver tried to overtake another vehicle on the bridge in the morning hours. Twenty-five people died on the spot while one died at a hospital during treatment,” he said. Chief Minister Vijay Rupani has directed district administration to ensure that injured were taken to hospitals for treatment in nearby hospitals. “Saddened by the loss of lives due to a road accident near Ranghola. May those who have been injured recover at the earliest. I pray for the departed souls. Om Shanti,” the CM wrote on Twitter.